The Horsemen: Book Of Olorun! Check It Out During Indy Comic Book Week December 27th, 2009! Above: Jiba Molei Anderson at the Comic Con International: San Diego, 2009. 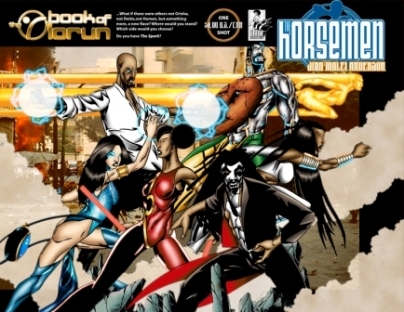 Above: A Poster Print for The Horsemen: Book Of Olorun. To the left: Full wrap-around cover for The Horsemen: Book Of Olorun! And stated that one of the persons that told me of this event was Jiba Molei Anderson. I thought that today I would blog about Jiba's publication that will be for sale during that upcoming event at selected LCBS in the Illinois, Michigan, New York, and California areas. Please note that I received an 'Official Griot Preview' .pdf file copy to review from, which does not always reflect what holding an actual printed copy in both hands could show when printed, or how the paper itself 'feels' when turning the pages while reading. I have already blogged about his earlier work on 'The Horsemen', thus I was familar with the storyline, the characters, and the artwork. The Orisha emerged from a deep slumber. Seeing that their mission had been perverted, they had set about to free us…whether we wanted them to or not. But, what if there were others not Orisha, not Deitis, not Human, but something more, a new Race? What side would they choose in the coming war? And, who truly controls the Eight Immortals but the number seven? The gods of ancient Africa have possessed seven people to protect humanity from itself…whether humanity wants them to or not. They have been chosen to combat those who control the fate of the planet. The Horsemen: Book Of Olorun TM and © Griot Enterprises & Jiba Molei Anderson. All rights reserved. Here in the 'Book of Olorun', the artwork once again is of fine craftmanship caliber, and the colors are vivid! However, the text narration boxes were a little hard to read for me, because of the white text on the yellow-orange background boxes. The word balloons were the normal black text on white background, which was clearer to read. I had a little difficulty reading the narration boxes from the .pdf file. Hopefully the printed format doesn't have the same level of reading difficulty. Jiba's artwork does seem to be more a pin-up style of artwork here in this issue. Now, there is nothing wrong with that, as long as you know going in that the artwork is that style. Several artists work in that style, adding their own flair to the work. There is still a story that is conveyed here, just that the storyboards are more of a pin-up style in presentation of that story. But I happen to like Jiba's art style, so that was OK with me in this issue. Chicago, IL - Graham Crackers, Brainstorm Comics, Dreambound Comics, 3rd Coast Comics, Keith's Komix. Michigan - Green Brain Comics. New York City - Midtown Comics. California - Four Color Fantasies in Rancho Cucamonga. For those of You that are NOT in those named areas... Jiba's publication can be found at Indy Planet at this link! SPECIAL NOTE: As an addendum, Jiba has called me and told me that he will be signing at Graham Crackers Comics one day only on December 30th from the hours of Noon to 2 PM at the Downtown location at 55 E. Madison. Please call that store to verify that on the day of the event, as events are always subject to change! For more info on Jiba's works and where YOU can be interactive with him and others about this series, please check out his 'Horsemen Graphic Novel Facebook Fan Page'! I will be blogging about more indy comics series right here at ComicBookCollectorsBlog.com in the days to come, right into the New Year itself as that is how long 'Indy Comic Book Week' continues into! AND... Thanks again to all of YOU reading our current and archived blog posts! We do blog usually on a daily basis during the work week on comic book creators, comic book reviews, comic cons, and other pop culture news and events including some TV shows and theatrical films as they are shown. 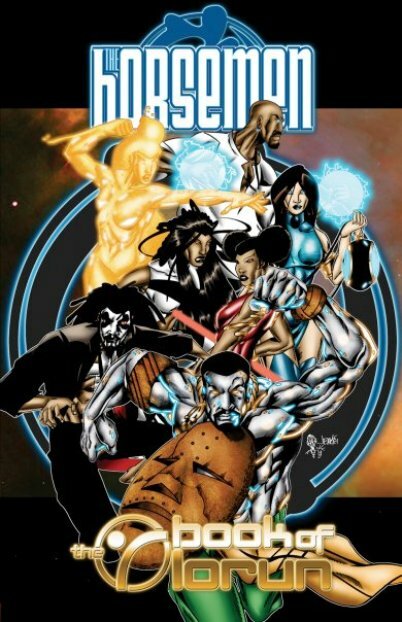 NEW COMICS SERIES: Today's Featurette section is about a comic book series that was sent in to me for possible review. However, it was just a single issue, #3, that I received. When I jump into a series that has already started, it is sometimes hard to catch up, UNLESS the creator(s) have a 'intro' page or 'what's happened before' section in the issue you currently are holding! 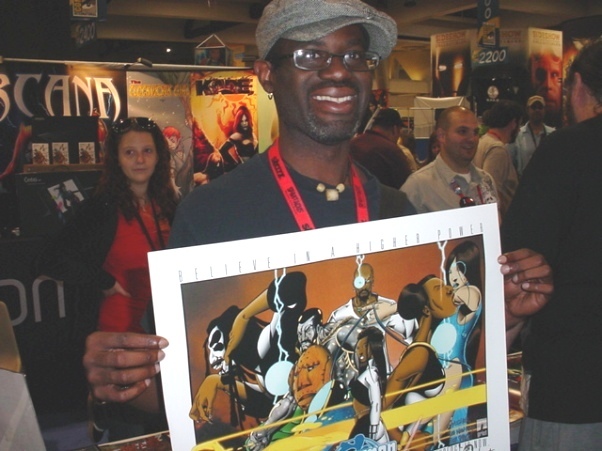 So I thank Mike Sales, creator and writer of Southside Nefertiti, who is pictured below at the 2009 Onxycon at his table, for putting in that recap! "Daughter of slain activist Kleo Jones, Nefertiti is a super-powered single mother who has built a good life for herself and her son Joshua, while still looking out for folks around the way. No matter what goes down, the Southside knows when they need help... they can always count on Nefertiti." Okay... here's my thoughts for this issue only: The cover is in color. The interior pages are black and white. There are two parts to this third issue in the series, and there is at least a fourth issue for this story arc. The artwork by Randolph Williams was well suited for the storyline and the black and white interior pages. There were several head shots, and talking scenes, yet plenty of action illustrated by Randolph! I didn't see the credits for the lettering, but that was a good job in lettering, especially with the sound effects used in the pages. I believe that a reader who started with the first issue would get more out of this series. The concept of Nefertiti is a sound one, and I like the background info. There are relationships between the characters which fleshes out those characters in this issue. I do note that even though I just recently received this issue, the copyright was 2007 for the publishing date. I'm not for sure how many issues have been printed to date, or if the story arc reached a conclusion. My thanks to Michael Sales for submitting Issue #3 of this series for possible review!